This past week I went spelunking into my freezer and I found two pounds of minute steak, or what the meat world calls chuck blade steak. 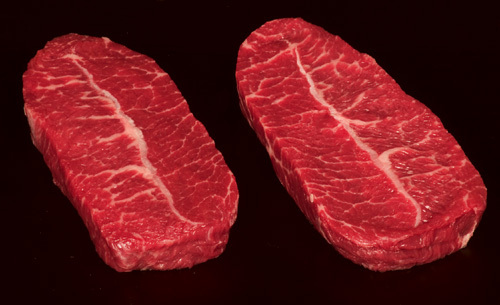 The steaks are kind of that Dr. Jekyll and Mr. Hyde meat. It wants to be braised but it also can work with a grill. Say what? Actually, the meat has a large amount of connective tissue with a thick gristle running down the middle. The best way to manage this cut of meat is to grill it after you marinade it for a few hours, or braise it. Well, I had no time to marinade the meat ahead of time, so I coated the meat with paprika, garlic powder, and black pepper. I then put them on the grill and used a bit of barbecue sauce as well. Finally, I placed the grilled steaks into a shallow pan, added in some more barbecue sauce into the pan, and then covered it with aluminum foil and placed the meat into a warm oven. Cut up the vegetables into large cubes 1 inch or more cubes. Then place them in a large bowl and fill the bowl with water to cover, and let them sit there for an hour of so. This is VERY important. It helps to accelerate the roasting process. Then pour out the water, and pat the vegetables dry. Next mix the spices together so that they are combined well. Next spread out the vegetable cubes into a large shallow roasting pan and cover with oil and then sprinkle the spice mixture over the vegetables. Then flip the vegetables around and add more spice mixture until coated very well. Finally, pre-heat the oven to 400 degrees and roast for 30 or so minutes, or until the vegetables start to caramelize. Heat up the oil in a large skillet till it starts to smoke. Then drop in the coarsely diced onions and saute them till nicely browned. Then add in the thickly sliced mushrooms and saute them till they have sweated out half their size. Then add in the garlic till they start to bloom, then add salt and pepper to taste. Finally add in the green beans, and mix everything up, so that the hot vegetables coat the green beans, and take it off the fire when the green beans just start to soften. The meal was absolutely killer! Sorry if I and tooting my own horn, but the pairings were just perfect. The meat was soft on the indie, yet crispy on the outside, the green beans were nicely wilted yet slightly crisp, and the roasted vegetables were lovely with the meat! 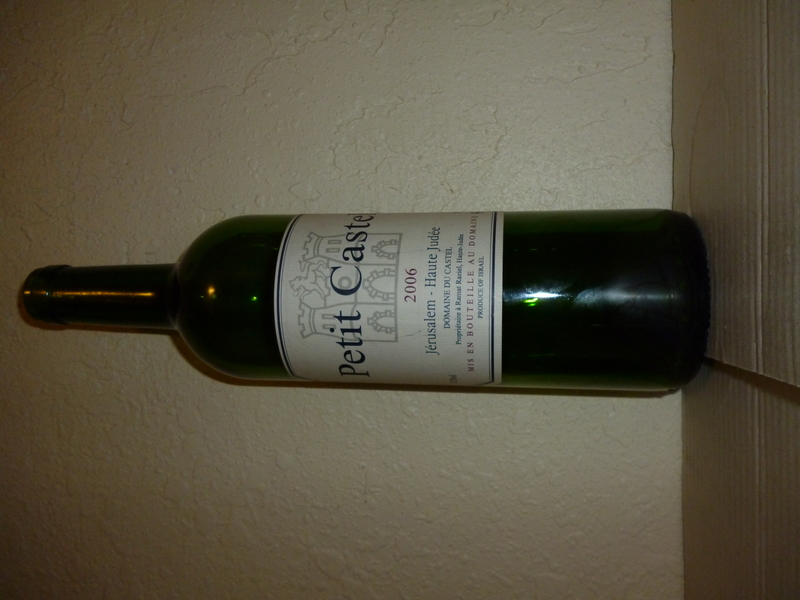 To pair with the meat we went looking for a rich red wine and pulled out a bottle of 2006 Petit Castel. I was really looking forward to a rich wine, but the wine’s lack of core acid made the wine feel flabbier and flat. The mouth was rich, but the date and sweet cedar flavors also turned me off. This is a bottle you really should be drinking up!! The nose on this black colored wine with brown tinge is rich with sweet cedar, chocolate, tobacco, herbs, date, very apparent green beans, ripe plum, blackberry, and currant. The mouth on this medium to full bodied wine is still rich and concentrated with green notes, ripe fruit from the nose, rich black cherry, mouth coating tannin, and sweet cedar all coming together. The wine is missing the bright acidity of old, which makes it feel a bit underpowered. The finish is long and super spicy, with rich black pepper, herbs in the background, and heavy sweet cedar and vanilla to round it out. DRINK UP!!! Posted on February 1, 2012, in Food and drink, Israeli Wine, Kosher Red Wine, Kosher Wine and tagged Domaine du Castel, Petit Castel, recipe. Bookmark the permalink. Leave a comment.